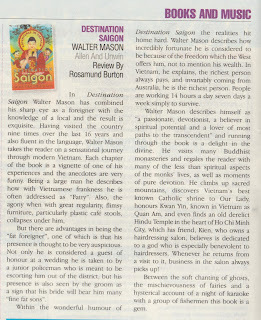 language, Walter Mason takes the reader on a sensational journey through modern Vietnam. Each chapter of the book is a vignette of one of his experiences and the anecdotes are very funny. Being a large man he describes how, with Vietnamese frankness, he is often addressed as "Fatty". Also, the agony when with great regularity, flimsy furniture, particularly plastic café stools, collapses under him, and the subsequent embarrassment when all the waiters in a place gather to erect a stack of stools deemed sturdy enough to take his great weight. But there are advantages in being the "fat foreigner", one of which is that his presence is thought to be very auspicious. Not only he is considered a guest of honour at a wedding he is taken to by a junior policeman who is meant to be escorting him out of the district, but his presence is also seen by the groom as a sign that his bride will bear him many "fine fat sons". 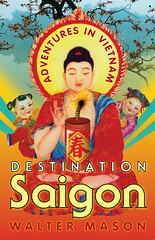 Within the wonderful humour of Destination Saigon the realities hit home hard. Walter Mason describes how incredibly fortunate he is considered to be because of the freedom which the West offers him, not to mention his wealth. In Vietnam, he explains, the richest person always pays, and invariably coming from Australia, he is the richest person. People are working 14 hours a day seven days a week simply to survive. One Vietnamese friend tells Walter that he does not allow himself the luxury of having big dreams because he knows that in reality not much is possible. Walter Mason describes himself as "a passionate, devotionalist, a believer in spiritual potential and a lover of most paths to the transcendent" and running through the book is a delight in the divine. He visits many Buddhist monasteries and regales the reader with many of the less than spiritual aspects of the monks' lives, as well as moments of pure devotion. He climbs up sacred mountains, discovers Vietnam's best known Catholic shrine to Our Lady, honours Kwan Yin, known in Vietnam as Quan Am, and even finds an old derelict Hindu Temple in the heart of Ho Chi Minh City, which his friend, Kien, who owns a hairdressing salon, believes is dedicated to a god who is especially benevolent to hairdressers. Whenever he returns from a visit to it, business in the salon always picks up! Between the soft chanting of ghosts, the mischievousness of fairies and a hysterical account of a night of karaoke with a group of fishermen this book is a gem.